East Williamsburg’s Moore Street Retail Market filled up with members of Bushwick’s Puerto Rican community last Thursday. 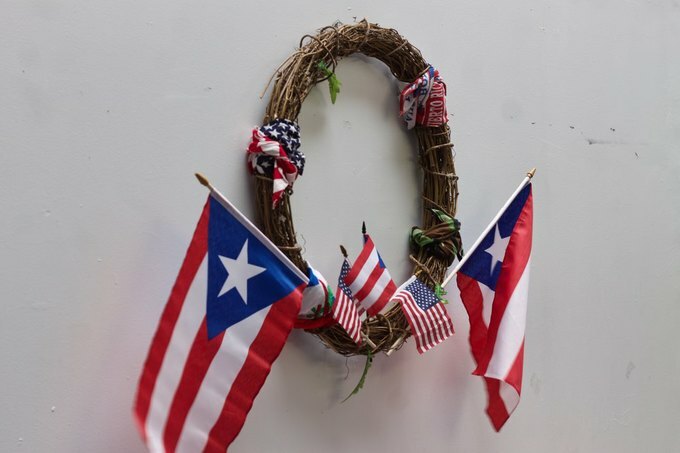 There were paintings representing how the storm devastated Puerto Ricans, wreaths with the red, white and blue flag and the anti-imperialist black and white Puerto Rican flag. 6:15 AM, precisely a year ago that day, Hurricane Maria had made landfall on Puerto Rico. In the year since, nearly three thousand died and thousands more were forced to leave their homes. Jay Solly, founder of a local marketing agency, has orchestrated the installation of a wreath which sat at the center of the wall in coverer public plaza. 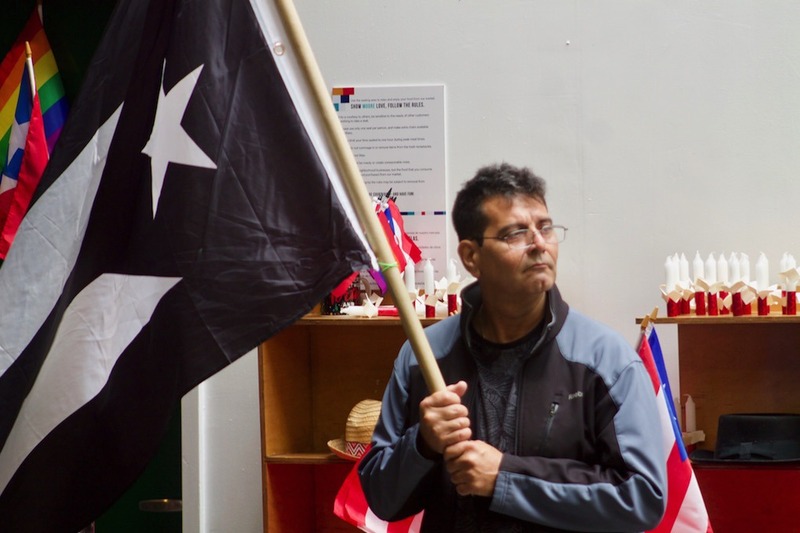 “We knew we would have to do something to look back on this as a community as soon as Hurricane Maria hit,” said Solly. Many of those assembled had witnessed either the Hurricane or its effects first hand. One of the event’s early speakers, Assemblywoman Maritza Davila, lead a group of some of the first volunteers to arrive after the storm hit. The passing a year had not diminished the rage Davila felt when she discovered lives ruined and senior citizens abandoned to the elements. “The way we’ve been treated has been despicable,” Davila said. 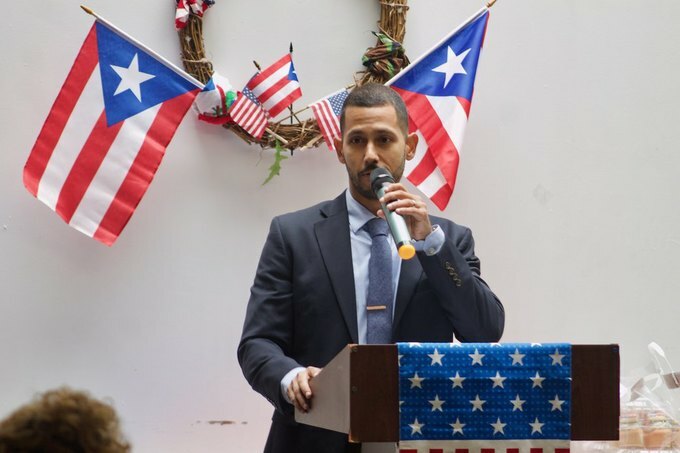 Alex Rodriguez of Councilman Antonio Reynoso’s office was less elusive about the human face behind the natural disaster. “Trump failed us,” he said. Only a week ago, Trump had returned to the subject of his administration’s first natural disaster. “3000 people did not die in the two hurricanes that hit Puerto Rico,” he tweeted. The comparatively rapid federal response to Hurricane Florence, which hit the Carolinas last week, did not go unnoticed. “We need to stop picking and choosing where we’re going to help,” Assemblywoman Jaime Williams told the crowd. Williams had joined Davila in Puerto Rico in that first journey, among others. She spoke proudly of the volunteers who had joined her there and complained that much of the natural devastation had initially received very little media coverage. New York State citations were awarded to those who had made the trip to Puerto Rico following the hurricane last year. A collection of some of the volunteers, police officers to community activists, stood against the wall of the market holding onto deep blue embossed folders. The morning’s political speakers also reminded constituents that action remained to be taken. “Congresswoman Velazquez is hosting a press conference at City Council steps to advocate for a resolution to be passed by City Council to pressure the Congress to create a commission as it was created for 9/11 to investigate the funding distributed to Puerto Rico," said Rodriguez, urging others to support Velazquez's efforts. The he event also turned to evacuees from Hurricane Maria, some of whom had gathered here as well. Solly passed around 5-hour emergency candles, meant to dually symbolize the candlelight remembrance and the remembered reality of days spent with no electricity. 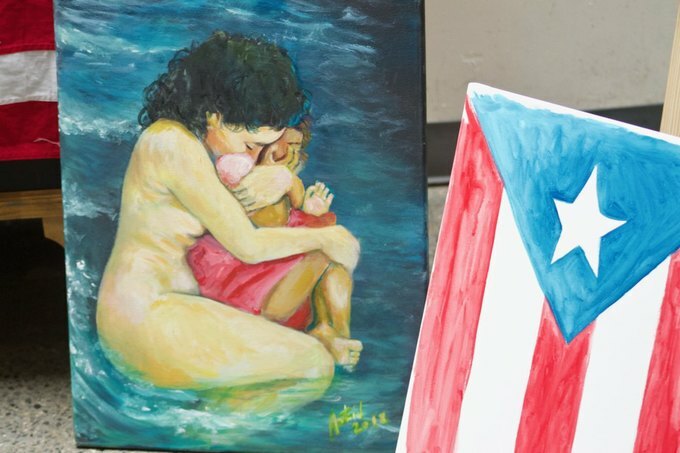 Astrid Lopez, who was an artist and coach in Puerto Rico, complained bitterly about being fed into a system that was “unprepared” to deal with the trauma of evacuees like herself. Lopez had made a number of paintings reflecting on that exprericane that were installed in a nearby corner. They included a minimal rendition of the Puerto Rican flag, a portrait of her dog hiding from the storm and a symbolic piece that showed the Statue of Liberty in tears, among others. Lopez was among those helped by a small organization called the YNCCA , which stands for Your Network Caring Community Advocate, was started by anti- gentrification activist Sonia Velasquez. She founded the organization in order to provide evacuees with resources that organizations like FEMA had not been able to efficiently provide or distribute. 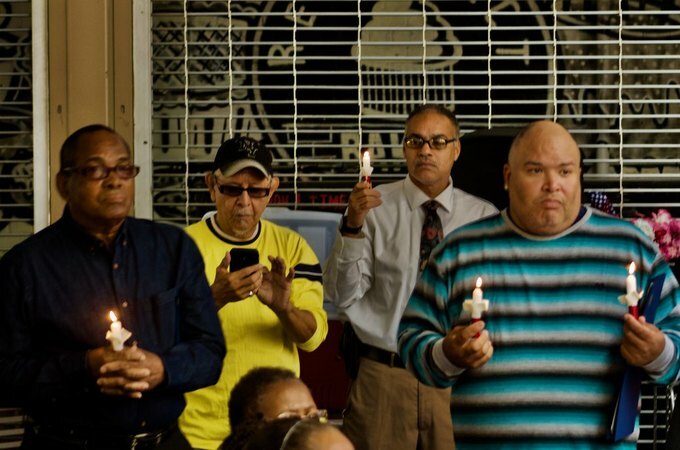 FEMA had also, a few weeks ago, stopped paying to house evacuees who have not yet found new homes since being forced to leave Puerto Rico and organizations like YNCCA have been trying to fill that gap.